I keep my iTunes music library very organized, but I have seen other peoples’ that are complete messes. Song titles, artists, albums, and a whole slew of other metadata is missing. TuneUp for Mac can fix that. Are you plagued by the infamous “Unknown Artist” or “Track 01”? If so, your iTunes library is probably best described as an unorganized disaster that is in need of some serious help. Don’t feel too bad – it’s a surprisingly common situation to be in. Considering all of the sources we get our music from now, there’s bound to be some holes to fill. Luckily TuneUp for Mac (limited free trial / $19.95 for 1 year subscription / $29.95 for life) offers an easy way to cut down on or even eliminate incorrect or missing song information. I wouldn’t necessarily call TuneUp a plugin for iTunes. It’s more of a companion app which stays nearby and works with Apple’s music software when needed. 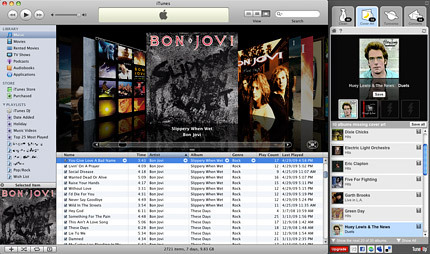 The TuneUp window pins itself to the side of iTunes and offers users four main functions: Clean (fix music metadata), Cover Art (add missing album art), Tuniverse (get information on the song currently playing), and Concerts (find out when your favorite artists are performing nearby). These are all great, but the ones that make this program worth checking out are Clean and Cover Art. Fixing mislabeled music with TuneUp couldn’t be simpler. You just select a group of songs in iTunes and drag them to the TuneUp window. After a few seconds (or minutes if you dragged a large group of songs), the software will display your results and even tell you how confident it is that its matches are correct. Not every one of them will be accurate (especially for rare or bootlegged music), but I would say it gets it right 80-90% of the time. And when you’re dealing with hundreds or even thousands of screwed up music files, that’s a whole lot of time saved compared to manual labor. You can choose to apply TuneUp’s metadata suggestions individually or all at once, then the changes will make their way to your iTunes library. If you find that a mistake was made and something was tagged incorrectly, no problem – just use the program’s convenient undo feature. TuneUp’s Cover Art functionality works just as easily. It will scan your entire library and offer a series of image choices anywhere it finds missing album art. The whole process is very intuitive and surprisingly enjoyable when everything goes right. There’s a real sense of accomplishment that comes with organizing a large music collection, and TuneUp helps make that happen. Win a free copy of TuneUp! Users with messed up iTunes libraries are in for a treat! The developers of TuneUp have been kind enough to offer a free software license to one lucky MacYourself reader! To enter, please leave a comment below, along with a valid email address (this is how we will contact you). In order to avoid spam filter issues, please type a coherent sentence saying you’d like a chance to win. Multiple entries will be deleted, so please only add one comment per person. And finally, don’t worry if your comment doesn’t appear on the site immediately — it might be awaiting moderation and will show up shortly. A winner will be chosen at random based on the comment number they happen to be. All entries must be made by June 19, 2009 at 11:59pm eastern U.S. time. That’s right… amidst enjoying my shiny new iPhone 3G S, I will be looking for our winner! In the meantime, download a free trial of TuneUp to try it out for yourself. Good luck! Congratulations to our winner Brian! His comment number was chosen from a random number generator and he has been given a free copy of TuneUp! Thanks to everyone who entered and remember to consider purchasing a copy of TuneUp yourself to fix the mess that is your iTunes library. Hi, i’d like a chance to win this license please. :)… thank you! Hey, I live in Belgium and would love a program like that! I’d love to win the license of TuneUp! Thanks a lot and greetings from cologne! This software could be very good. I’d like a chance to win the license to please. Thanks. Kind regards. My wife’s iTunes library has quite a few “Track 1” songs. It would be awesome to win this license. The app looks promising It really does. And… a great give-away initiative. I will tell my friends about it. I really would like a chance to win the free license of TuneUp! Consider this my entry for the giveaway! Thanks! My iTunes needs a tune up and I’d like to win the the prize. Thanks! Ooooo. Clean iTunes. Please, thanks. 2,735 songs and counting. I definielty would enjoy the free license of TuneUp! Sounds too good to be true. I definitly want to give it a try. wow! I have about 150 CDs with messy song name & artist & cover & …, it’d be great to win such app! Look’s like it might be a little nicer than FixTunes, i like the interface of this better. Itunes sure did a number on my collection. During an import of music it added tracks from the m3u playlists and the regular songs in the folder so there’s at least 2 copies of everything in my library :( sure would like to win this tuneup! my iTunes library is a total mess and i don’t have the time to spend hours sorting it. i think i deserve a chance to win this prize! Great app! Wish i’ll win. I would love get a license for this.. I hope I am selected! I’ve been using this application for a while, but have no album cover-usage left, (used all 50) i’m totally bummed! I have tonnes of music to patch up and winning a free copy would be pure bliss! I hope I’ve met the deadline! I truly can use this software, i have been looking for a product, no needing a product like this for years! Hey i used tuneup on my itunes library and it worked. it organized everything all neatly and now my ipod touch cover art looks so much better. the sad is i cant pay for it and i would like to win. if not then ill buy it. Take this app with a LARGE grain of salt. Sometimes it’s surprising what it finds. Other times it’s not even close. There is no way I would turn it loose on a library. And album at a time is all I will let it have and then I watch it very closely before I save anything. I have close to 3 TB of music, and I’d say about 900 GB needs to be cleaned up. I am a film student and a music lover. I cannot afford right now to buy the full version, but the trial version did wonders for the 100 songs I tried. Best software EVER! my itunes library is a mess i can never find songs because their always in the wrong place or under their artist as the title. I will be first to admit its very embarrassing to be so musically unorganized, but its just so time consuming to keep a well up to date library especially with my student schedule and trying to find all of the correct information. I even downloaded genius for play lists because i thought it was going to do what tuneup is now doing, and cleanup my library! Ive been dreaming of this program ever since i got my generation 1 ipod, about the day it came out! now from a sweet commercial on TV i found the magical program.